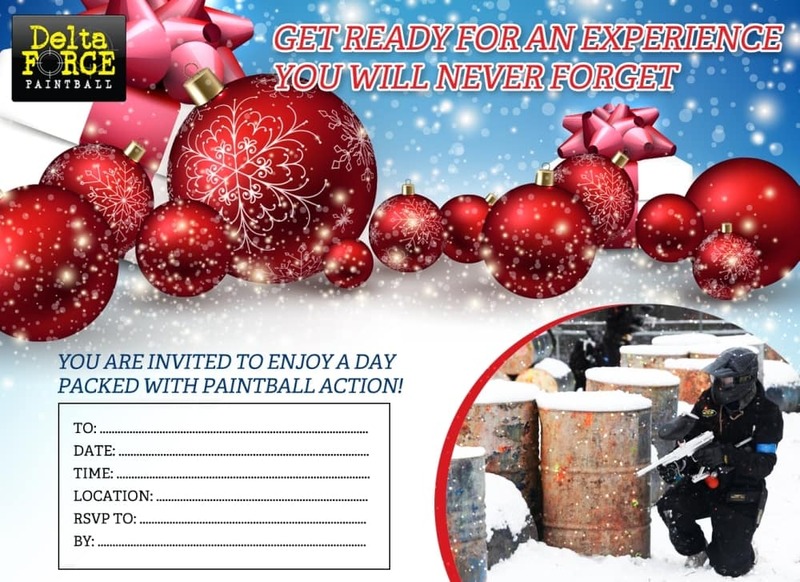 Organise Christmas paintball party with our brand new invitations! Christmas may seem like a long way away but it is actually just around the corner. The phones at the Delta Force Paintball call centre are ringing off the hook with people trying to arrange their Christmas parties. At the moment we’re booking in all sorts of groups, from work parties and family outings to church groups! For the convenience of or customers, Delta Force Paintball offers free invitation downloads to make organizing your paintball party that little bit easier. In light of the Christmas season approaching we now offer Christmas party invitations, what do you think? Paintball is becoming an increasingly popular activity to bring in the Christmas season and organising your Christmas paintball party with Delta Force couldn’t be easier. We look forward to welcoming you at one of our paintball centres for your next paintball event. Book your day out now by visiting the paintball booking page or calling our events team 24 hours a day, 7 days a week on 0203 869 9301.